An additional source of biologically active substances of plant origin. It promotes normalization of nervous system functioning, improvement of general psychoemotional state in case of increased nervous excitation, elimination of alert, normalization of sleep. It has soft calming effect. Motherwort — 0.45 g, Melissa leaf — 0.1875 g, Melissa plant — 0.1875 g, mint leaf — 0.1875 g, mint plant — 0.1875 g, hop cones — 0.18 g, valerian root — 0.12 g.
Motherwort has expressed sedative (calming) properties, as well as spasmolytic and anticonvulsive effects, slows down heart rhythm and intensifies heart force, it has expressed hypotensive and cardiotonic effect. Melissa has calming, spasmolytic, as well as light hypnotic effect. It is used as an effective sedative agent. 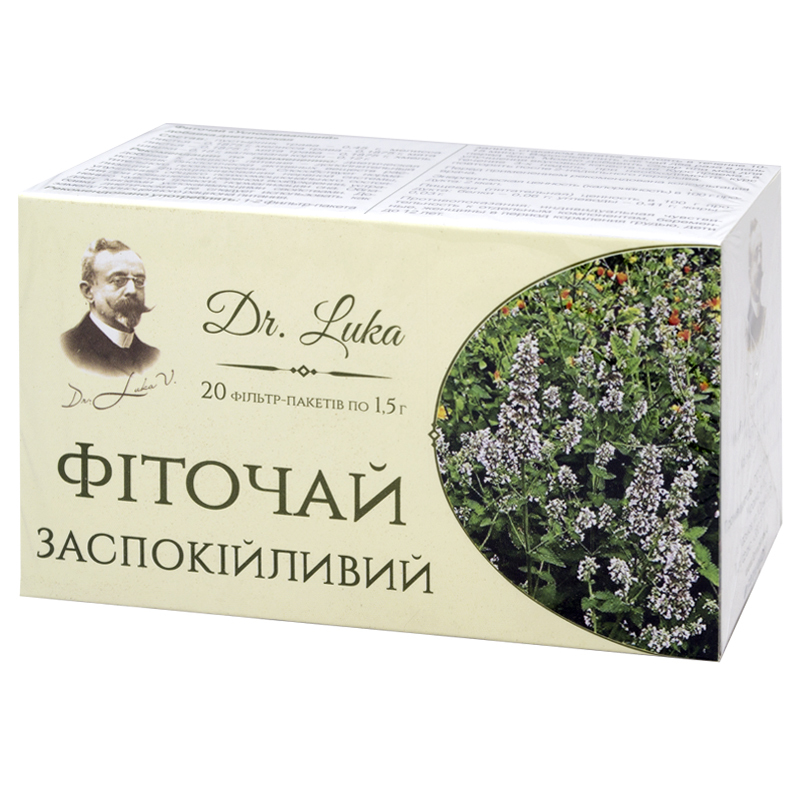 It is indicated in case of general nervous excitation, hysteria, vegetovascular neurosis, disturbances of sleep (insomnia, early awakening), migraine, neuralgias. Melissa is also used for pain in the heart, tachycardia, irregular heart rhythm, in case of nervous trembling (in the night) and changes in blood pressure under the influence of emotional factors, in case of atherosclerosis, dizziness, tinnitus. Mint has light calming, moderate spasmolytic, antiseptic and pain relieving effect. It is also used as a sedative agent in case of increased excitability, insomnia and various neuroses. Hop is used for insomnia, nervous overstrain, increased nerve excitability, vegetovascular neurosis (especially of hypertonic type), hysteria, climacteric disorders. Valerian is used for chronic functional storages of CNS functioning, in case of nervous excitation, neuroses of the cardiovascular system, hysteria, acute agitation due to psychical trauma, for migraine, insomnia, angina pectoris, pain in the heart area, stage 1 essential hypertension, premature ventricular contraction, paroxysmal tachycardia, acute myocarditis, in case of climacteric disorders. Put 1-2 bags in a pot and add a glass of boiling water, let it infuse for 10-15 minutes. Adults drink as tea twice a day before meals. To improve the taste add some sugar or honey. Term of use – 3 weeks days, repeat in a two weeks’ break if necessary.